The history of driving games is an unusual one. Whereas most genres follow a linear evolutionary path, becoming steadily more complex and more technically impressive with time, driving games are different. 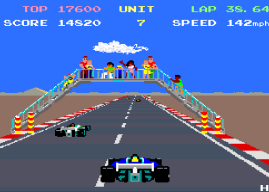 Driving games started in 3D and then went backwards to 2D for several years. They started off quite technically realistic and demanding, then went backwards and became more simplistic and easier. Graphics got prettier, more colourful and more dramatic, then went backwards and became greyer and duller, and so on. We needed someone intimately familiar with the idea of going forwards then backwards to chart it all, so obviously we called Stuart Campbell. Konami’s 1986 coin-op WEC Le Mans, which isn’t mentioned anywhere in this feature. 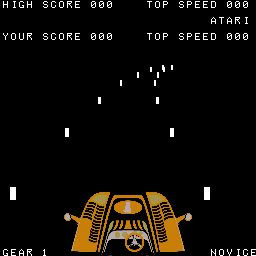 The first instance of driving a car in a videogame was on Atari's 1976 classic Night Driver. A black screen faced the player, decorated only with a series of short white posts disappearing into the horizon to produce an eerily convincing sensation of 3D. Speeding through the moonlit world at the kind of game velocity the hardware could impart by, essentially, having no graphics (even your car’s bonnet was just a plastic sticker attached to the monitor), you couldn't afford to take your eyes off the screen for a second. Steering wheels were next seen in videogame parlours on the Sprint series of overhead-viewed circuit games, starting with Sprint 2 in 1976, confusingly followed by Sprint 4 and Sprint 8 in 1977 and finally Sprint 1 in 1978. The numbering doesn’t denote sequels - although the various games did have different tracks - but the number of players. Sprint 8, impressively, was therefore for eight players simultaneously, all squished around one fairly normal-sized machine and making arcade owners swoon with happiness. To compensate for the lack of human opposition, Sprint 1 does a remarkable and unique thing: the tracks change while you’re driving. One minute you’re zooming round a nice simple loop, then without warning the entire course switches to a complex crossover route, and then a few seconds later morphs again to a zig-zag collection of long straights, and so on. If you’re not expecting it – and why would you be? – it’s hugely startling and scary. Night Driver - in fact, not even nearly the first driving videogame. Fooled you! Ha ha! Night Driver and Sprint both had purely demarcative graphics – that is, wholly abstract lines and dots which served only to mark the distinction between the traversable course and the “walls” marking the limits of where you could go. The first coin-op driving game to feature actual graphics in the sense we understand the term today (that is, depicting some sort of actual scenery) was Atari’s 1977 release Super Bug, which gave the player an identifiable vehicle (a VW Beetle) some dense woodland to drive through. Super Bug also saw the first introduction of “realistic” handling – in addition to having to cope with manual switching through four gears (something not seen in arcade games in the following 30 years), your Bug is prone to drift, fishtailing like crazy if you go round corners too fast. It’s an incredibly demanding game which will leave the most dedicated modern racing fan weeping in a corner within minutes. Not satisfied with that, though, Atari followed Super Bug up with the conceptually similar Fire Truck the next year (which despite still being in greyscale also saw a significant aesthetic improvement, with the graphics now depicting an identifiable and rather attractive, albeit somewhat Lego-ey, suburban landscape with houses, lawns, trees and parked cars). Fire Truck was the first - so far the only - co-op driving game, and saw two players charged with steering a single fire engine through the scrolling overhead course, with one of them driving the cab and the other trying to keep the trailer under control. (There was a later single-player version called Smoky Joe.) It’s absurdly difficult, and almost certainly the most technical driving game ever created, making a mockery of Gran Turismo fans and their fiddling with wheel balancing, brake adjusting and grocket fondling. Only when you can complete a 90-second Fire Truck run without a crash can you consider yourself a truly skilled pretend driver. sometimes I miss the old candy-cane primary colours of the original. Probably the first game that modern gamers would recognise as a racer of the sort we play today, the original Ridge Racer slightly predated Daytona USA and is also a far better game. However, you can’t argue with a sequel that's basically all the best bits from all the RR games put together with better graphics, and that’s what you get in the monstrously-inaccurately-named Ridge Racer 2. 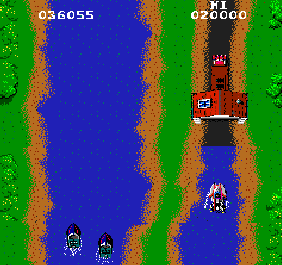 The only downside - shared with big-brother titles RR6 and RR7 - is that it starts off terribly easy where the original was challenging from the off, but then with only one-and-a-half tracks the original HAD to be. There’s such a crazy amount of content in RR2 that it can afford to give a big chunk of it away cheaply at the start to lure in the beginners and develop their skills for the stiffer challenges ahead. 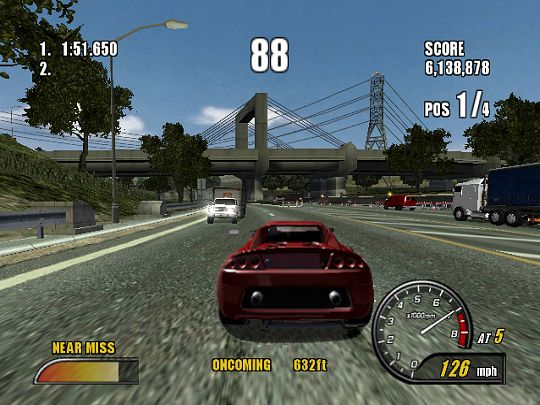 With the possible exception of Burnout 2 (see below), simply the most complete road-racing game of the modern era. In the early days, Suzuka’s spectator facilities were sparse. The first Pole Position was a phenomenal success, and the sequel actually did rather less well. However, it was a very influential pioneer in a very specific field, namely the inclusion of multiple real-life racetracks. 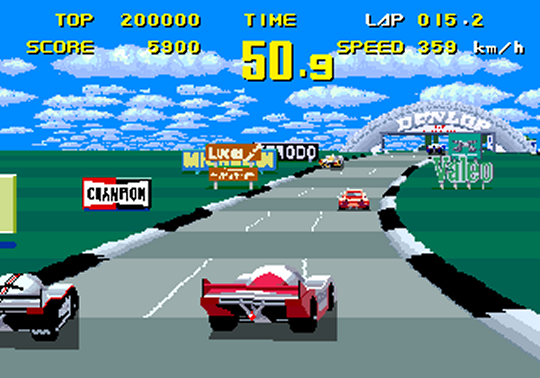 PP1 had dipped a toe into the water with a pretty authentic take on the Fuji Speedway course in Japan – the first time a real-world track had appeared in a videogame - but PP2 offered four selectable courses all based around real-world race venues, adding recognisable versions of Indianapolis (a simple oval), Long Beach and Suzuka. Namco extended the concept with their Final Lap series, which expanded the roster with interpretations of Silverstone, Catalunya, Spa Francorchamps and Monaco, and it’s almost as hard to imagine an F1 game set in fictitious locations now as it is to imagine one with only one track. is well worth picking up on the excellent-value Sega Classics Collection. Virtua Racing is a wonderful game, but it’s historically important for mostly a strange and unfortunate reason. VR offered four switchable camera positions, the best of which was the high overhead cam which gives the driver the clearest possible view of his racing line. 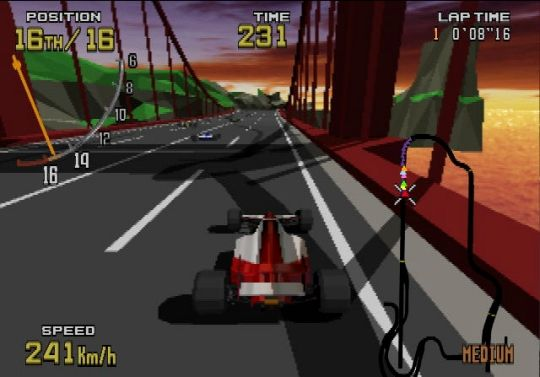 But the most popular was the first-person perspective, something which had been rare in driving games until that point, and the high overhead cam was immediately binned for all Sega’s subsequent arcade racers, perhaps also because of the extra processing demands it would make when rendering their more complex, textured scenery. 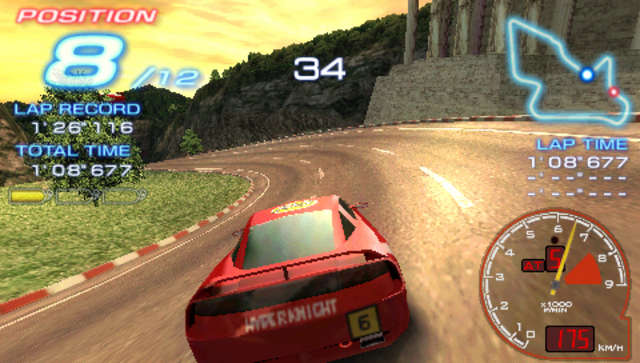 The side-effect of that was to destroy, almost overnight, the credibility of the entire overhead-view racing genre - which till then had maintained significant success with games like Super Sprint, Hot Rod, Super Off-Road and Micro Machines - and focus future driving-game development entirely on the first-person view. It’s not much of a legacy for such a great game, but history can be cruel. back of a truck parked in a shed and turn it into a sports coupe’ genre. Bally’s 1983 classic Spy Hunter isn’t strictly the first racing game in which you can directly attack your opponents with weaponry – you could argue, for example, that Namco’s 1980 Rally-X claims that accolade with its smoke-screens, or that Bump’n’Jump from Data East two years later deserves it by enabling you to actually destroy opponents. But in the sense we understand the genre today, Spy Hunter is the crucial first ancestor of games like Mario Kart and Wipeout, where shooting or otherwise interfering with your opponents is at least as important as overtaking them. It was remade in 2001, with modest results. One of the best games, in any genre, of its generation. Sadly, it was all downhill from here for Burnout. Now derived from the 1984 ram-racing template of Bump’n’Jump, The Burnout series is an excellent example of why someone invented the phrase “If it ain’t broke, don’t fix it”. A franchise which started with a menacingly serious game of almost Spartan minimalism and toughness is now little more than a bloated, devalued insult to the intelligence of 11-year-olds, offering up spectacular pyrotechnics and breathless cascades of medals and trophies to anyone who can hold down a fire button. But the second game in the series is a masterpiece, combining white-knuckle racing tension with the brilliantly cathartic interludes of the Crash Junctions. Subsequent iterations would screw up both elements of this simple genius horribly, but Burnout 2 strikes a perfect balance between challenge and reward whether you’re racing or crashing.